Acme Bar and Grill is a chain of food and wine restaurant in Scottsdale, AZ. The food chain specializes in offering different types of Grilled foods, seafoods, and salads. The individual bar section is one of the main attractions of these restaurants. Headquarters of the organization is in Scottsdale, AZ. Franchise services from this food and restaurant chain is available in different states of the US. Along with the special dishes, different native food items are also offered here. Review say that it is one of the biggest grilled and seafood restaurant chain in Scottsdale. Special entertainment facilities like DJ nights are arranged in these restaurants. 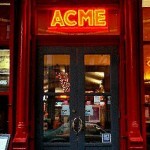 There are currently 0 consumer reviews about Acme Bar & Grill available. Share your review. Please take a note that you are about to post a public review about Acme Bar & Grill corporate office on CorporateOffice.com. This review will be public, so please do not post any of your personal information on this website. If you would like to contact the corporate offices of Acme Bar & Grill, please use their contact information such as their phone number, website, and address listed above to contact them. However, sometimes staff from Acme Bar & Grill headquarters do read the reviews on this website.